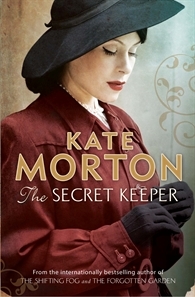 The Secret Keeper by Kate Morton is an engaging story that’s easy to read. There were no surprises for me at the end. The clues to the story’s “twists” were laid carefully for any reader who knew this wasn’t going to end in disappointment. For much of the story the reader is led to expect the novel’s message will be about forgiveness and atonement, about “second chances”, spurred on by a mystery: one of the central characters, the present-day actress Laurel, seeks to know explain her mother Dorothy’s seemingly heinous behaviour when she was a teenager. But it doesn’t fully address the question of evil, unless evil can be equated with the consequences of magical thinking in childhood when the child doesn’t mature successfully. That’s what interests me about the book, its psychological take on its characters. In between reading, I also listened to two discussions on Radio National’s Counterpoint program. A quick aside: Counterpoint’s new presenter, Amanda Vanstone, the ex-Howard government Minister Assisting the Prime Minister for the Status of Women, consistently used the universal “man” in her discussion, swapping to “humanity” only when she referred to an actual woman. To me, this suggests the depth of what women face with internalised gender bias: we’re not even aware it exists, let alone its ramifications, or possible impact on what, as girls and women, we might expect of ourselves; how we can mature to find security, safety, a sense of belonging and self-esteem without falling back on stereotypical notions of “a woman’s place”, or what makes a “good woman”. These themes are also important to The Secret Keeper. The first discussion I listened to was with writer R Jay Magill Junior on sincerity. This touched on the question of what we like and admire about people – especially politicians – and how this may differ from their skills in leadership or ability to get a job done. It acknowledged the gap between what we want to think about ourselves and our heroes – that we’re essentially good people – and the political and social realities. Essentially, it presented the old dilemma: how can we have leaders who can make tough decisions when the solutions to problems aren’t always in accord with notions of decency, freedom, altruism and fairness; how can such leaders remain sympathetic in the eyes of an electorate? The result is spin, a seemingly necessary duplicity which caters to both expectations of the audience, the voters. This might seem a long way from The Secret Keeper and the actions of three strangers in war-torn London, but it’s not: central to the novel is the question of narcissism – or pathological self-absorption – and how it arises as a defence mechanism as a result of trauma; and empathy, the ability to place oneself in another’s shoes and anticipate or intuit how they might feel in any given situation. Such issues are also touched on in the second discussion I listened to, one with psychiatrist Dr George Henry on what makes a good person. Vanstone introduces the discussion by saying how quiet women are often judged as “good”, while “noisy” women – like her, she says – are judged to be “difficult”: “A forcefully spoken man is regarded as strong and a forcefully spoken woman is regarded as aggressive.” But what about the “quiet ones”? she asks. Are they always “good people”? This dualism is depicted in The Secret Keeper. Servant girl Dorothy is vivacious, outgoing, always good for a laugh and a good time; she is also self-serving, duplicitous and self-deluded. Socialite Vivien is quiet, good-natured, and passive to the point of being a victim. Both are dreamers; both have suffered trauma and loss. The question the novel appears to pose is this: can Dorothy, a perpetrator, be redeemed and rewarded with happiness, family, sufficient wealth and peace of mind, despite her crimes? Crucially, can she, as she approaches the end of her life, be forgiven by her daughter? It’s an interesting question, and one the novel never answers. Instead, by the wonderful sleight-of-hand that is fiction, we find ourselves in an alternative narrative, one of “Virtue, Patience and Courage Rewarded”. Essentially, we’re snatched away from considering a tough question about what humans are capable of, and what justice, forgiveness, atonement and redemption may really involve, and we’re given spin. Without further thought, the result for the reader could be the same, with our prejudices reinforced. People like “us” are okay; people like “them”, we don’t have to worry about: the allure and comfort of popular fiction. Recently on Twitter was a discussion which spilled over from a convention on genre fiction held in Sydney; it was about whether the term “literary” is a separate genre. One of the key attributes of literary fiction, suggested one author, is a “realism” which is often equated with pessimism. The key to popular fiction, I heard some time ago, is “aspiration”: the world not as it is, but what we might hope it to be; not how others are, but how we would like them to be; not how we ourselves are, but what we’d like to believe ourselves to be. There is a conundrum here that The Secret Keeper identifies. Aspirational thinking is symptomatic of the very narcissism and lack of empathy which results in tragic consequences in the novel. Could our craving for popular fiction be symptomatic of a similar kind of pathology? A denial about ourselves and our shortcomings, a recreation of the world as we would have it, not as it is? Perhaps. But even popular fiction books like The Secret Keeper can be self-referential enough to shed light on this topic. It’s not all spin. In The Secret Keeper Morton identifies the need for escape into fantasy as a need stemming from trauma and loss. It’s a self-protective mechanism, she shows, and it takes inner strength, courage and hope to break free from. In order to mature into a healthy, empathic adult, one needs conditions for such inner strength to thrive: friendship and love, safe shelter and nourishment, worthwhile employment, humour and imagination, and someone to believe in us, other- as well as self-esteem. When such needs aren’t met – or aren’t perceived as being met by the narcissistic individual – it’s hard to be virtuous. It’s a gentle take on humanity and a page-turning read. This review counts as 11/12 for my Aussie Author Challenge 2012 and as part of my ongoing contribution to the Australian Women Writers Challenge. The Secret Keeper has been reviewed for the challenge by Jon Page at Bite the Book and Shelleyrae at Book’d Out. Thanks, Annabel. It’s great to have support for stepping outside the traditional review format. The view of popular fiction as aspirational makes a lot of sense to me. It helps to explain not only why it’s popular, but also why it’s reviled in some circles – as if “truth” – emotional and/or intellectual – has to be mimetically portrayed in the narrative in order for it to be worthwhile (a view which would easily be recognised as meaningless in discussions of much fantasy, myth and speculative fiction). Great quote re literary and genre fiction, Lisa. I look forward to reading your response to The Secret Keeper. It’s a very enjoyable read. Here, here… I always enjoy your innovative take on book review format. We can all read a synopsis – it’s the reader’s reaction to the book I’m after, and what I try to focus on in my reviews also. I’m glad you enjoyed the review. I like to read the reader’s reaction too, and I hate spoilers! I usually don’t even read reviews unless I’ve already read the book – which might seem to defeat the purpose of most reviews, but I like to think of them as conversations.